Action from the 2018 Women & Automotive Canadian Leadership Forum. Photo by Jonathan Fredin. Since launching the Women & Automotive: Canadian Leadership Forum in 2016, Cherokee Media Group has honored and recognized a group of Canada’s leading women in automotive each year through our Women & Automotive: Profiles in Leadership program. Not only have these groups been recognized in the January/February editions of the Auto Remarketing Canada magazine, but they have also been honored at awards luncheons onsite at the Women & Automotive events. And many honorees have been included in the event’s star-studded speaker lineups themselves — folks like Cox Automotive Canada president Maria Soklis, TradeRev and KAR Auction Services’ Becca Polak, TRADER Corp’s Samantha Huen, and many more. 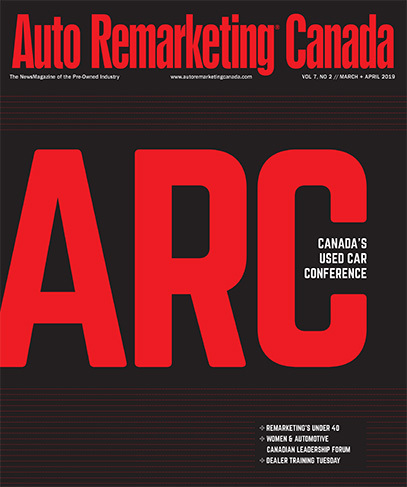 Each year, these profiles and the event itself gives Auto Remarketing Canada the chance to share leadership lessons and thoughtful insight on the auto industry. And this year is no different. Without further ado, here are the 2019 Women & Automotive: Profiles in Leadership honorees. These women will share their stories and perspectives in the January/February print and digital editions of the Auto Remarketing Canada magazine and at the upcoming Women & Automotive Canadian Leadership Forum, which is once again scheduled to follow the Auto Remarketing Canada conference on March 21 at the Westin Harbour Castle in Toronto. The Profiles in Leadership program drills down into what it takes to be a leader in today’s automotive industry, as well as what makes it unique and challenging to be a woman in auto — and how to tackle the steps and hurdles to automotive career success. In these features, we approach questions like how to describe leadership style, what leaders have inspired these professionals throughout their career, what paradigm shifts they’ve encountered since entering the auto industry and more. To learn more and register for the Women & Automotive event, visit https://www.womenandautomotive.com.